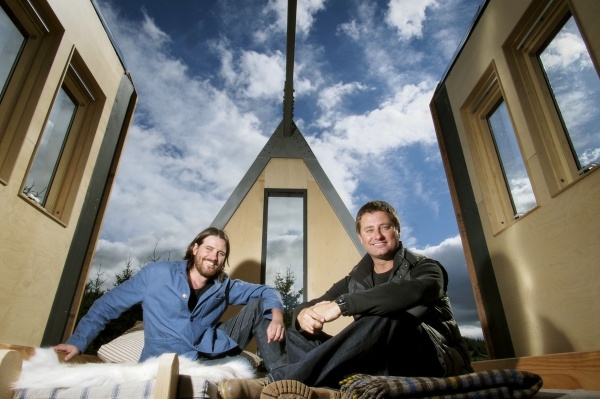 Architect George Clarke will quite literally lift the lid on his extraordinary tree house project in Kielder Forest, Northumberland, to the nation on Thursday December 12 2013. Over the last eight weeks, TV viewers have watched the Sky Den’s progress on Channel 4’s George Clarke’s Amazing Spaces with much anticipation. In Thursday’s (December 12) episode at 8pm, Sunderland-born George will finally reveal the finished design of his accessible tree house, sited at Calvert Trust Kielder within the award-winning Kielder Water & Forest Park. Created in collaboration with designer William Hardie, the Sky Den features a triangular pod with a spectacular opening roof, revealing the darkest night skies in the whole of England. Budding astronomers will be able to lie back and revel in the star-studded skies of Kielder Water & Forest Park which, together with Northumberland National Park, has just been awarded Europe’s largest Gold Tier Dark Sky Park by the International Dark Skies Association. George’s project has ‘shaped’ up well – made up of another two pods, guests will be able to choose from viewing the forest inside the unusual circular shelter, heated by a wood burning stove, to relaxing in the square room with its innovative furniture they can pull from the walls to put together themselves. Calvert Trust Kielder, where the Sky Den is located, is a charity which helps people with disabilities to achieve their potential through outdoor activities. For more information contact Janine Scott, Communications Advisor (Kielder Water & Forest Park), on 0191 301 5538 or janine.scott@nwl.co.uk.